No matter what your skin type or skin concern may be, it is always vitally important to hydrate your skin. Following on from our previous blog posts about Step 1: Cleanse and Tone and Step 2: Treat and Repair, it is now time to follow Step 3: Hydrate and Protect. When you moisturise, you repair the barrier function of your skin protecting it from the environment and making it look plumper, healthier and smoother. Firstly, it is important to hydrate your skin at a cellular level. This means taking the right supplements for your skin type and eating lots of juicy fruit and vegetables. The water inside fruit and vegetables is structured, meaning it’s surrounded by molecules that help it get into cells easily and quickly. They are also rich in healing antioxidants your body needs and keeps you hydrated much longer than just drinking water would. To target the top 20% of your skin, you need to use the correct moisturiser for your skin type. Using the Personalised Skincare Evaluation can help you do just that. During the day, make sure you are using a facial moisturiser with sunscreen. At night you can switch to something much thicker loaded with rich hydrators, antioxidants and plant extracts. Don’t worry about doubling up on ingredients such as antioxidants and skin soothers. You never can get enough of these anti-ageing miracles! If you suffer from oily or acne-prone skin, use an oil-free moisturiser like the Oil-Control Mattifier SPF 15 during the day. This has the added bonus of not only ensuring you have a perfectly matte complexion but protects skin from damaging UV rays too. At night you could use something like the Skin Perfecting Lotion, which intensely hydrates skin while keeping pores clear and oil-production under control. If you suffer from redness, think back to art class and the colour wheel. Using a moisturiser with a green tint like the Correcting Moisturizer SPF15 will calm and soothe irritation while disguising any redness. If you find you have particularly dry skin, you might benefit from using a serum, like the Sensitive Skin Soothing Serum. You can either use this on its own, or add a drop to your regular moisturiser to make it richer. The most important thing to remember when moisturising is not to use too much. A pea sized amount should cover your entire face, neck and chest. This will help to maintain skin softness by retaining a high level of water in the outer layer of your skin. Moisturisers achieve this by forming a barrier that keeps moisture in and keeps harmful substances out. 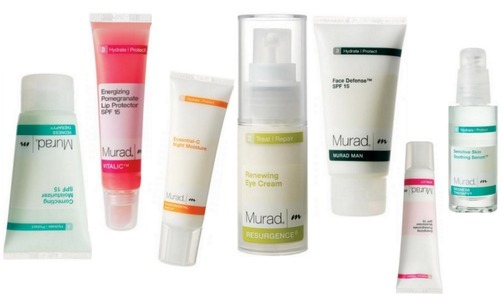 Doing the 3-step Murad regime every morning and night is a simple way to have gorgeous, healthy skin every single day. This entry was posted in Acne and Spots, Anti-ageing, Sensitivity and Redness, Topical by muraduk. Bookmark the permalink.